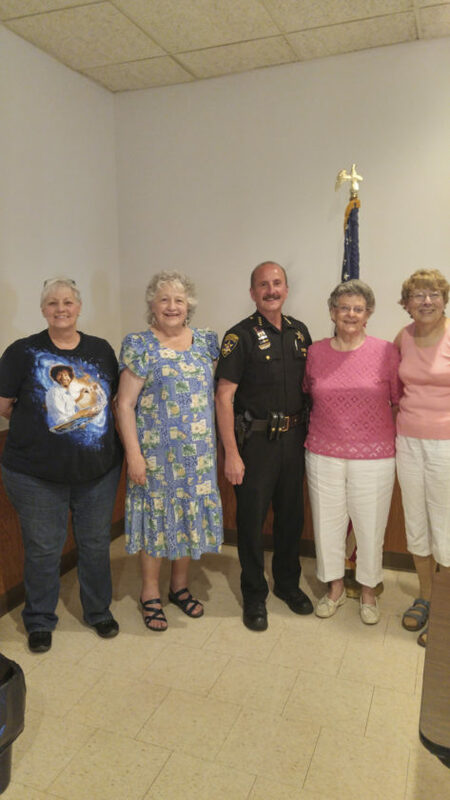 Submitted Photo Vice President Linda Riley, President Mary Matteson, Sheriff Joseph Gerace, Greeter Genevieve Ludemann and Treasurer Evonne Hennebery. Members of the United Senior Citizens met July 9 with Genevieve Ludemann greeting and President Mary Matteson leading the group in the Pledge of Allegiance and “God Bless America.” Member Robin Carr offered the invocation and moment of silence for deceased members Linda Cobb, Mayme Joy and Jane Walsh. After Sheriff Gerace took leave, callers were thanked: Josie Wierczynski, Linda Riley, Nancy Niebel and Pat Ebert. July birthdays noted were: Nicholas Andin, Kathy Damiano, Elaine Frederickson, David Lewandowski, Frederick Summerton, Ken Woolstrum and Lester Fuller. Joe Greco Jr. did great work selling raffle tickets and winnings were welcomed by Mary Edwards, Carr and new member Thelma Saden. In the absence of joke teller Russell Dalby, one was recited by Carr, given to her by Ludemann. Bingo was played afterward, called by Lucy Saeli and Rosemary Mancuso. Members are reminded that dues are paid in accordance with the time frame formation of the organization. Any questions contact the Treasurer, Evonne Hennebery. The next meeting will take place on Monday, Aug. 13 at noon at the Fredonia Beaver Club, 64 Prospect St.. Picnic lunch will be hamburgers, Italian sausage with peppers and onions, rolls, potato salad, tossed salad, baked beans and fruit salad for dessert. To reserve lunch: $10 per member and $11. per guest, send check made out to United Senior Citizens to Evonne Hennebery, PO Box 706, 44 East Fifth St., Dunkirk, NY 14048 by Aug. 6. United Senior Citizens reminds the public to display their American Flag on July 27 (National Korean War Veterans Armistice Day), the day in 1953 the Korean War ended.